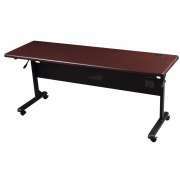 What are the advantages of flip top training tables? 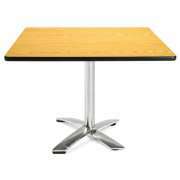 Unlike classic training tables, those with a work surface that flips down are much easier to store and transport. When it comes to versatility and flexibility, they are the best choice by far. 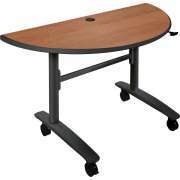 If you sometimes host conferences or training sessions, or want the flexibility to rearrange your space easily, flipper training tables are the way to go. 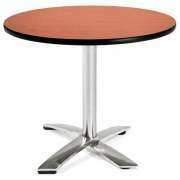 There are lots of things to consider when you are choosing flipper tables. 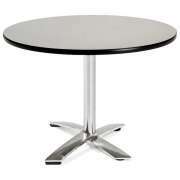 Obviously, you want shapes and sizes that will fit the space or spaces you plan on using the tables in. Of course, there is also the matter of style, making sure that what you choose coordinates with your current furniture and the room. Don’t forget to choose some convenient extras like grommets and wire-management trays, to make your flip top training tables as functional as possible. How can I save space in my seminar or training room? When you are trying to fit as many employees or participants as possible into one room, choosing the right tables makes a big difference. Obviously, you need to consider the size and shape of the worksurfaces you are choosing. While individual tables are smaller, they actually end up taking up more space, when you are trying to fit the maximum amount of people in one room. 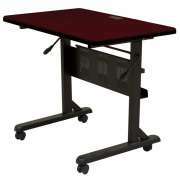 It’s better to choose flip top training tables that seat two people, and have a smaller work surface, while still allowing each participant to have enough personal space. 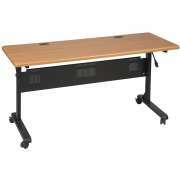 What is the best way to store seminar tables? 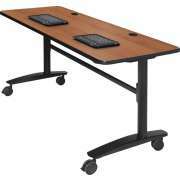 If you plan on storing your tables between conferences, flipper tables are definitely ideal. Their work surfaces fold down for space-saving storage. 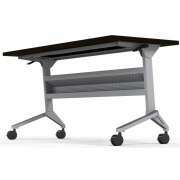 This allows for nesting, so you can fit tables in the smallest area possible. Having a top that flips down is also convenient when you are transporting tables. It allows you to easily steer through doorways and squeeze down narrow hallways without knocking into anything or anyone. 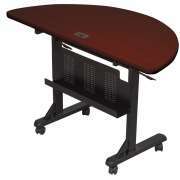 What is special about flipper tables? 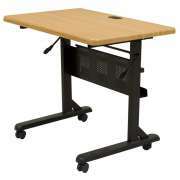 The flip-top feature on flipper training tables is obviously the most unique thing about them, but there are plenty of other optional features that can make these tables even more convenient. Grommets are pretty helpful, especially now, when most people work on laptops or tablets at conferences. To complement grommets, you can also get a cable-management tray built into the modesty panel, so you can invisibly route wires to a power source. There is also the option of getting connectors so you can put multiple tables together. This is obviously more ideal if you want a more permanent arrangement and don’t plan on moving tables around regularly. 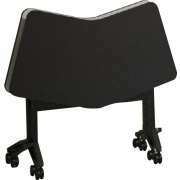 How do you move nesting tables around? 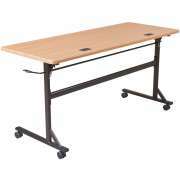 With casters built into the bottom of your table legs, you can easily glide your nesting training tables to the desired location. Make sure that you check the quality of the casters, and ensure that they can be locked. Although rolling tables around when you are setting up is very convenient, you certainly don’t want them sliding all over the place in the middle of a session. 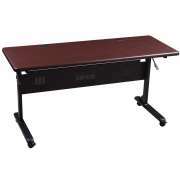 As with any purchase, there are lots of factors to consider when you are choosing flip top training tables. There is no one right choice for everyone, each company or school has to consider what the appropriate selection is for them, based on what fits their space, needs and budget.